Syrian Archbishop says "Public opinion in the West is held hostage by the media"
Archbishop John Darwish leads the Melkite Archdiocese of Furzol, Zahle and Bekaa in Lebanon. He is Syrian born and, when we visited him as a part of the Mussalaha delegation in April 2013, he was evidently deeply concerned for the people of his beloved homeland. The following is an extract from an interview the Archbishop did with ‘Catholic charity Aid to the Church in Need’ on December 18, 2013, while visiting New York. In it Darwish shows himself to have a heart not simply for peace but for reform in Syria and across the Levant. Q: What are the biggest needs of the Syrian families in your care? What are their living conditions? Archbishop Darwish: For one thing, they do not live in tents, or in camps. They live in rented homes, sometimes with multiple families in a single home or a set of rooms. By contrast, there are at least 10,000 Syrian Muslim families living in refugee camps. Most of these Christian families, however, are in need of the very basics of daily life—food, educational opportunities for their children, medical care. We help the poorer Christian families pay their rent; we also try to find work for the young men and adults. There are many skilled laborers, for example plumbers and electricians. We also have created a chaplaincy to minister to the refugees, the majority of whom came from the city of Homs and surroundings. Many of them are in bad shape, emotionally and materially—they left everything behind and came here with literally nothing. Jihadist rebels came to them at night and forced them to leave immediately—they are traumatized, because they were unable to mourn and pray for their dead. We try to support them emotionally and financially. For example, I did sent a request to the European Union to help my Church support those 800 families which will cost about $4 million per year. Q: There have been reports that the Syrian Christians in your archdiocese are reluctant to register themselves with the UN and other aid organizations for fear they will be identified as Christians and subject to potential reprisals. What can you say about this situation? 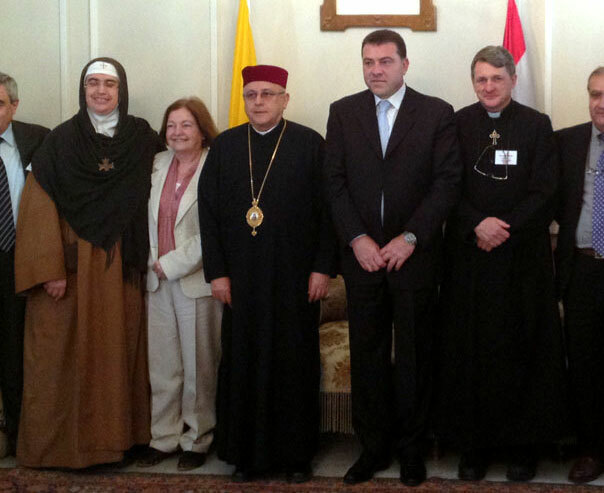 Archbishop Darwish: I try to convince them to register and thus become eligible for benefits. They are afraid—they don’t want to be involved whatsoever in the war; they worry that their names will be given either to the Syrian government or the rebels. They feel more comfortable being helped by the Church. I don’t believe they have real reason to be afraid, however, and we have tried to help matters by organizing meetings between the families and representatives of the UNHCR, the UN Refugee Agency. I encouraged the Agency to work with us directly. But officials apparently are not too eager to do so, but we are making some progress. It is also a matter of perception—UN officials see Muslims living in tents, in the camps, while Christians are living in regular homes and do not seem to be in such need. There is some discrimination. But it is part of the mentality of the Christians, their particular sense of personal dignity which makes Christians avoid the camps. The situation makes it all the more important for me to reach out to Christians in the West and ask them to support our work. Q: Are you disappointed by the relative silence on the part of Western governments and even religious communities with regard to the hardships of Christians in Syria and throughout the Middle East? Archbishop Darwish: Public opinion in the West is held hostage by the media. People don’t understand our real problems. What the media are missing is the reality of what is going on in Syria and elsewhere. They have missed the meaning of the so-called “Arab spring.” There is no Arab spring; there is no push for democracy—it is a push for theocracy, as we saw with the revolution in Egypt that brought the Muslim Brotherhood into power. Jihadists from all over the world are coming into the region—just consider the various radical factions in Syria, like Al Nusra. So far, the moderate opposition to the old regimes has been weak. Also, Western governments cannot simply impose their form of democracy in the region. There is not one, single form of democracy. The Arab world must find its own form. For many Muslims today, there is simply no separation between religion and state. Arab society must become more mature in order to embrace the notion of a lay state. That will take a lot of time. But Christians have an important role to play in this process. What we can do is collaborate with moderate Muslims, here in Lebanon, in Syria, and in other countries of the region. Quietly, we have begun doing so, because there definitely are partners for dialogue within the Muslim community. I chair the Christian-Muslim Dialogue Committee in Lebanon and my main focus is to help all faiths find common ground so that we can live together in peace in the Middle East. This was the effort Pope John Paul II called for when he visited Lebanon in 1997 and delivered his post-synodal exhortation following the conclusion of the Special Assembly for Lebanonof the Synodof Bishops. Q: What would you like to see happen at the peace conference for Syria scheduled to be held in January 2014? Could you envision President Assad staying in power? Archbishop Darwish: Until now, we have not been able to envision who could possibly replace him. We are afraid Jihadist forces could grab power and impose their ideology on all Christians and moderate Muslims. That would be very unwelcome also to most Syrian citizens. Ideally, there would be some accommodation between Assad and the secular opposition. What I would love to see happen in Geneva is a halt to the provision of weapons and money to all parties; support for Syria to rebuild what has been destroyed; an initiative that would force all parties to come together and find ways to reconcile and agree on the kind of reform that would fit all Syrians; and the granting of the fundamental freedom—in Syria, and throughout the Middle East—for Christian converts to register themselves as such, in a census for example. Only Lebanon respects this liberty today. In all other countries a convert to Christianity from Islam cannot register his marriage or his children, although he is allowed to worship. If the Churches were granted a place at the table in Geneva, this is what we would propose. This entry was posted in syria news, syrian civil war and tagged Lebanon, Middle East, syria, Syrian Archbishop, UN. Bookmark the permalink.